Do you need to travel without worrying about the number of kilometres you are going to do with a hire car? Do you like the road and can drive miles and miles for days on end? Are you planning a road trip with several friends to attend an important event? At Goldcar we offer drivers the possibility of car hire without a mileage limit. If you are thinking of taking a long road trip or if you simply know that you are going to drive for many days or long distances, we believe that at Goldcar we have the ideal rent a car for you. Forget the limits and restrictions on your hire, no matter how far you go. 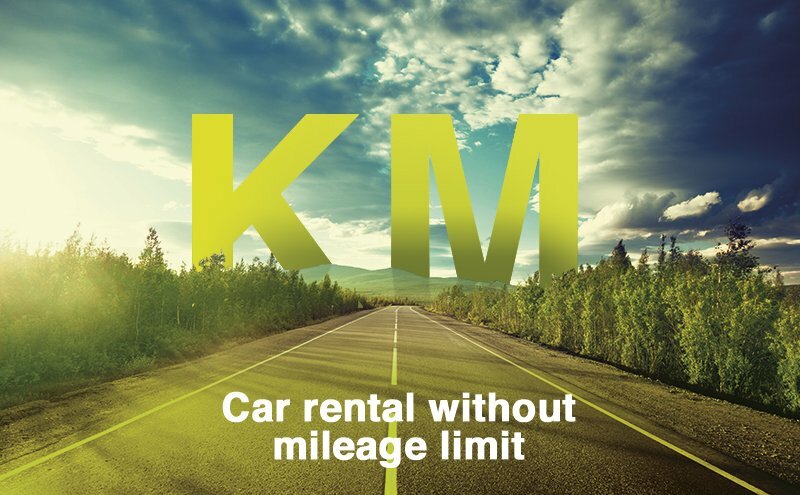 With our unlimited mileage car hire service you can drive happily from a large number of Goldcar offices and with most of the vehicles in our fleet. Also check the cover packs of your car since some already include unlimited mileage. A modern and renewed Fleet: 80% of the vehicles are renewed every 9 months. The best low cost prices and online offers. We guarantee reduced and competitive rates. A roadside assistance service 24 hours a day. Key'n Go: Car hire without going via the counter with self-service keys in kiosk. Click'n Go: Car hire without going via the counter and without keys, by opening and closing the vehicle from your mobile. In most of our offices there is no mileage limit, although some do have it. You can check it in our terms and conditions by selecting the office where you want to hire. To check the specific case of the hire you are interested in, once you have selected the dates and the destination on www.goldcar.es, if you click on the vehicle card you are interested in, you can check if your reservation has a mileage limit. If you are thinking of making a big trip in a group, either with friends or family, you can consult our classes I, J, JJ and K in the booking search, since we have several models of vans and hire cars over 5 seats. A van or minivan with several drivers plus unlimited kilometres will allow you to make that long trip you are thinking about. Goldcar has offices spread across 19 countries around the world such as Spain, Portugal, Italy, France, United Kingdom, Croatia, Malta, Holland, Greece, Turkey, Andorra, Cyprus, Serbia or Iceland, where you can find the best prices on your car hire.